With democratic process coming under scrutiny in many parts of the world, and elections being held in many countries including in Europe, the United Kingdom, Turkey and Venezuela, it could be interesting to have a look at the recent elections held on the world’s most remote inhabited island. 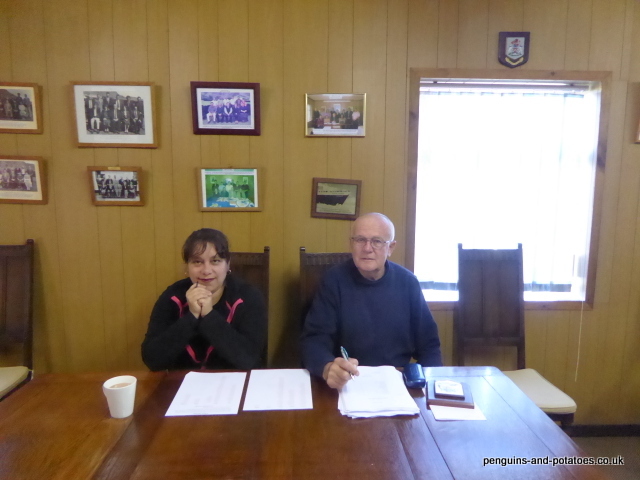 Every three years Tristan da Cunha holds elections. The object of the elections is for the islanders to select members of the Island Council, and at the same time the Chief Islander is selected. All islanders aged 18 and over are allowed to vote – currently there are 213 persons on the electoral roll, out of a total population of 247. In order to stand on the Island Council, a person has to be aged 21 or over. The electoral process on the island is quite straightforward, as you would expect with such a limited population. I became quite involved in the process since I was appointed Presiding Officer for this year’s elections. The election was set for 26 March, and this meant that around four weeks before Election Day we announced Nomination Day, with notices announcing that day being pinned up on the notice boards and being sent around the Departments. This gave the people time to discuss within the community whom they would like to see on the Island Council, and whom they would like to see as Chief Islander. Nomination Day was fixed for the 11th March. There were eight positions to be filled on the Island Council, and each person being nominated had to submit a form containing his or her name together with the signature of two supporters. 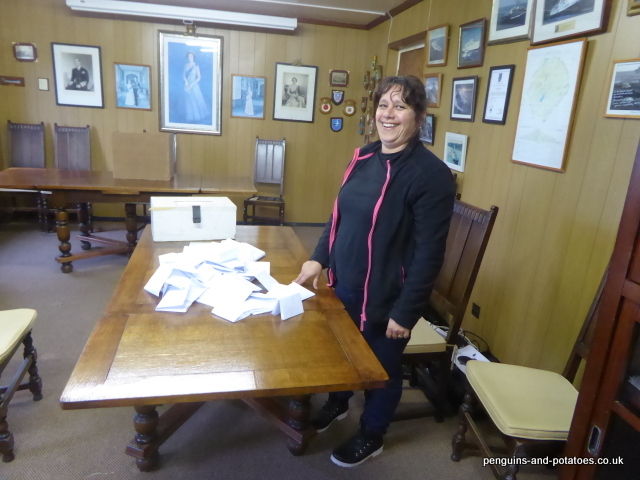 Each Nomination Form covered two separate events, that is the election for a place on the Island Council, and the election to be selected as Chief Islander. By the closing time on that date we had 13 nominations for the Council and 2 nominations for the Chief Islander – the battle had started! It should be mentioned that there are no party politics – the contest is every man for himself. The Election itself was held in the Council Chambers. Voting started off being brisk, but by the time the afternoon came along it was decidedly quiet, with just four or five votes being cast an hour. There are two ‘variations’ to the voting process, which could be described as ‘Tristan specials’, and which are only possible because of the few number of people and the fact that everyone knows everyone. 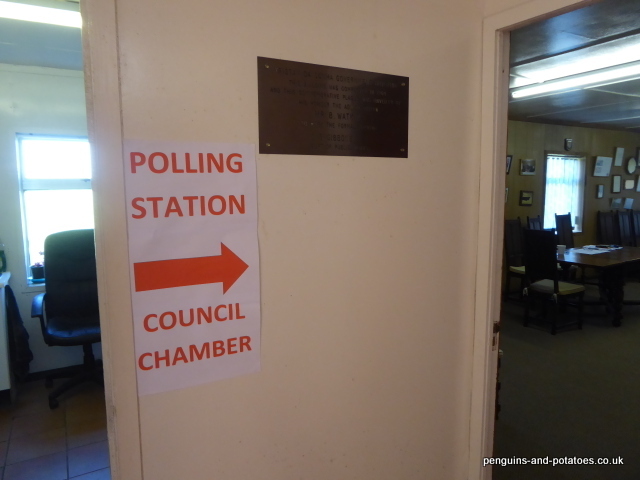 Firstly, the Council Clerk went around all the pensioners on the island, to see if they wanted to vote and to offer them help them fill in the ballot paper. This service was very much appreciated, especially by some of the more infirm pensioners who would have found it difficult or impossible to get to the Council Chambers. There are 70 pensioners on the island at present, which is 33% of the registered voters, and clearly it is really good to be inclusive towards this large sector of the population. The second variation can be called the Postal Vote, although it cannot really be described as ‘postal’. At any one time there are always numerous islanders who are off-island. For example, at present there are quite a number of people who have gone to Cape Town as medivacs, or for other reasons. There is a Tristan Fisheries man and his wife in the UK helping the refurbishment of a fisheries protection vessel, and there are two girls at school in Winchester who have just recently turned 18. All told there are 23 islanders who are off island and who are registered to vote. We arranged with these people that we would accept votes being sent by email, since there would be no problem with being sure of the identity of the individual. We even arranged to take telephone votes if the people so wanted – the Council Clark would confirm the identity of the voter by voice, and then hand me the phone so that I could record the vote, thus the voter would have the confidence of their voting preferences being handled by a neutral expat. These ‘postal votes’ reflect the personal touch that we can manage on election day thanks to having such a very small population. At 6.00 in the evening, we checked our emails to make sure there were no last-minute postal votes, and we started the count. By 7.30 it was all done, subject to the figures being double-checked in the morning, and the provisional results were telephoned through to the Administrator. There was one last step needed to complete the list of members of the Island Council. The Constitution provides for 8 elected members on the Island Council, and for 3 further members to be appointed by the Administrator. He had the task of judging which three islanders would best make up a good balance to complete a strong and effective Island Council – and then to persuade his three chosen people to accept the position. We had a poll of 74.6% of the electorate. We have a brand new Island Council, with only 3 people who were also on the council during the previous term. And we have a new Chief Islander, after the retiring one served for three terms in succession. Job done – for another three years!